These are cute. I modeled them after the ever popular dog beds. I designed and made each of these with my own pattern. This one is for Hamsters or Gerbils. 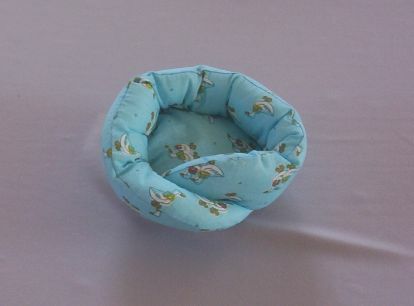 I will tell you I have made these for my own small animals and not only have they been "tested" I am happy to tell you that they love the little animals beds. This one is approx. 6" round and approx.3" high. It is stuffed with the same human quality fluff a person would use in a human pillow. It is made from a Tiny Swan Print fabric. The beds are machine or hand washable. You could dry them in the machine or let stand to dry. 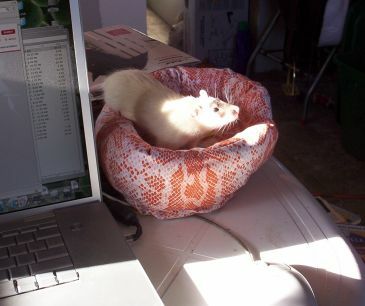 Small Animals love these beds. This item is new and has never been used. It was made in our non smoking home.